What’s the common factor between walking briskly down the street to your next appointment, running on your favorite trail or sleeping restfully at night? It’s exposure to pollution, and it’s inescapable. We face pollution whether it is day or night, or if we are inside or outside of our homes and buildings. According to BreatheLife2003, 92 percent of the world’s population — urban and rural — live in places with air quality above the World Health Organization (WHO) guidelines. Wondering about the air quality where you live? Here’s a quick check on the air quality in your city. When it comes to measuring pollution, size matters. Particulate Matter (PM), measured in micrometers, range in size from PM10, which is visible like dust, to PM2.5, which are fine, smaller and inhalable sizes. Particles less than PM10 in diameter pose the greatest problems, because they can get deep into lungs, and some may even get into the bloodstream. When it comes to our bodies, our lungs are our best built-in defense against pollution, but skin is the largest organ of the body and the first contact with pollutants. When we expose our bodies to heavy metals, it is cytotoxic. We need personal care products to prevent, protect and repair our bodies from pollutants. To better protect the skin from aggressive pollutants that damage and create havoc on our bodies, recent technological advances in skin care show promise. Alicia Miletic from TAOS Inc. states that, "Inside pollutants are heavy metals, and anti-pollution technologies trap these metals to help prevent further damage and help repair skin." Common technologies like film formers are available as a method of anti-pollution protection. However, Indena Inc., distributed by TAOS, has a naturally derived technology called Vitachelox, made of green tea extract, grapeseed extract and oakwood extract, which have been proven to protect the cells’ vitality and their powerful antioxidant capacity and reactivity. Studies were performed using the Vitachelox technology in Europe and Asia to measure heavy metals trapped on skin. The procedure for the study was a split-face evaluation: A lotion formula with Vitachelox technology was applied on one half of the face, and the other half of the face had a placebo lotion without any technology applied. Results of the study showed that the side of the face using Vitachelox trapped or prevented 100 percent of heavy metals from penetrating further into the skin. Mitelic states, "Another benefit from this technology is effective protection from blue light, which is a current concern for digital screen users." A study conducted in France has shown a protection rate of up to 82 percent from skin cells damaged by blue light. 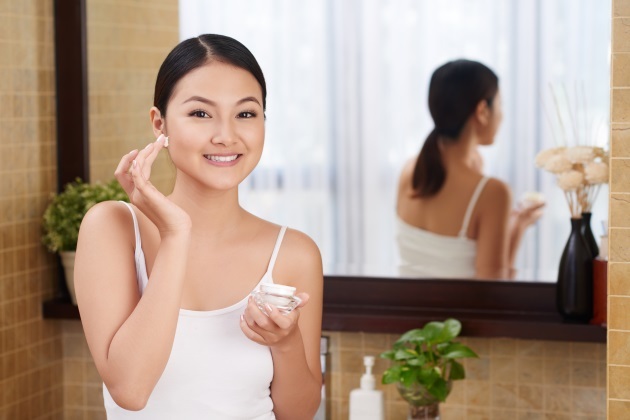 Look for anti-pollution products in the beauty market in the form of day and night creams, serums, and body care categories.